One of the things I love about the world right now is that we are more socially connected than ever. I can follow and learn from and be inspired by people in different places on Instagram or Facebook. One of those is Aisha Bam. I follow her and her group Fitte Factory on Instagram. Aisha inspires me because her joy in moving her beautiful machine is evident in each picture. She is joy-filled. She combines a love of strength and mobility and shares it with the world on her Instagram page. 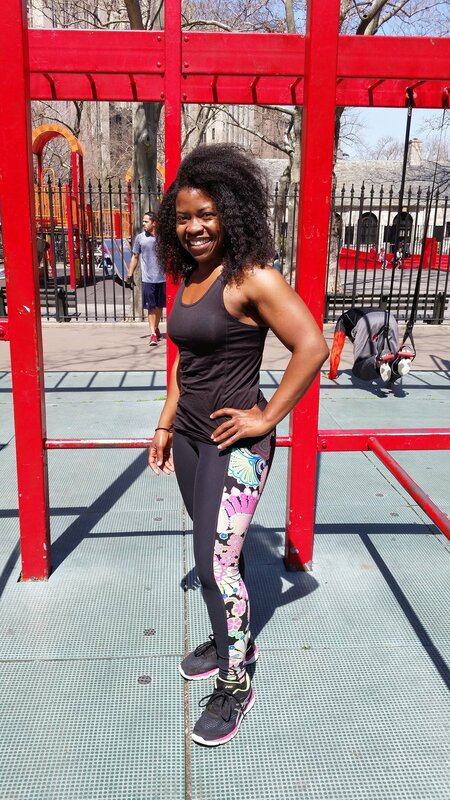 Aisha teaches yoga and is part of a group of teachers that share a love of calisthenics and yoga with people in New York City. Also, Aisha makes movement a regular part of her life. She has found ways to move that light her up and she does them regularly. Would you tell us please about your road to wellness? I always had a curiosity for wellness and fitness but I didn’t have a solid foundation. I’d workout at the gym a little here and there, but I wasn’t consistent and didn’t really know what I was doing. From my senior year of high school to my college graduation, I went from weighing about 145lbs to 214lbs. My cholesterol was high and reaching down to tie my shoes was a challenge. The weight gain was simply because I loved to eat (and still do). I got my first job during my junior year in high school and was able to afford my own food. I made it a point to eat at major fast food chains simply because my family couldn’t afford that type of food when I was growing up. I was making up for all the times my mom said “I don’t have McDonalds money.” I also ate all of the food on my plate even if I was stuffed because I was taught not to waste food. In my mind, I knew that I would eventually lose weight after I left college since I’d have more time to focus on fitness. By 2012, I had lost 40lbs on my own with little physical effort. I was inspired by books like In Defense of Food by Michael Pollan and the movie Food Inc. The one line in the movie that stuck with me was “we vote with our forks” so I started reading food labels and slowly changed my diet. As much as possible, I try to stay away from processed foods with too many ingredients. I try to avoid anything with high fructose corn syrup, soybean oil, hydrogenated oils and anything that’s difficult to pronounce. The rest of the weight came off through boot camps and other fitness classes (like PRX14.) I enjoy working out in group settings. I love the support of other participants who are going through the same process. In 2014, a friend introduced me to Revolutionary Fitness. I consider them the icing on the cake in my fitness journey. They were big on food/fitness justice. Their goal was to make high quality fitness accessible to underserved communities as well as to arm the people of those communities with the education and knowledge to take care of themselves. In 2015 I went through their certification program and became a People’s Trainer. The director of Revolutionary Fitness added me to their teaching calendar and I taught kettlebell and yoga classes. More recently a group of friends and myself started running boot camp classes under the name Fitte Factory. We train in many different modalities which included HIIT, strength training, mobility and yoga. Would you please share about your yoga journey? 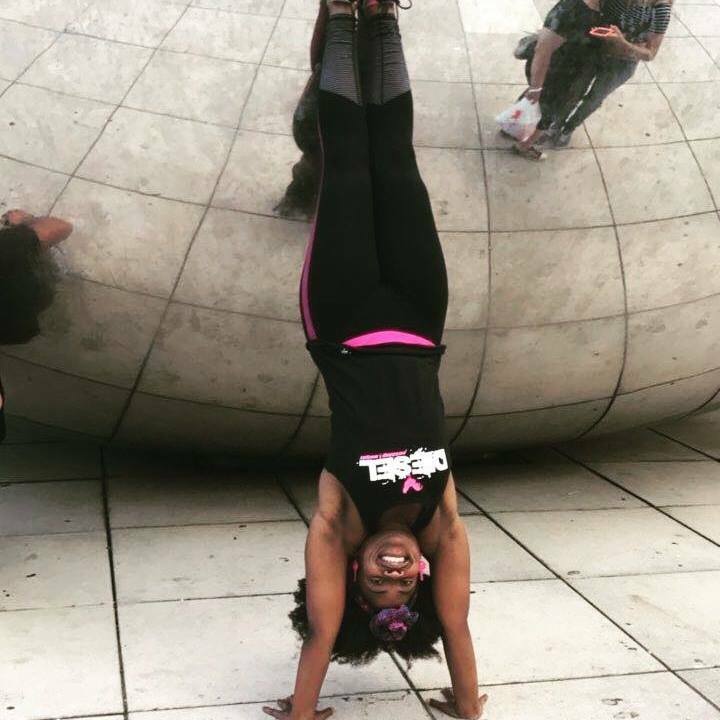 My yoga journey started in 2011 when a friend of mine convinced me to go on a hunt with her for nice yoga studios around the city. She wanted to start taking yoga classes but didn’t want to do it alone. We started going to Pure Yoga and at the end of my first, I felt a sense of pure bliss and presence. It was unlike anything I’ve ever felt. It helped me manage some stress and anxiety that I was dealing with at that time. When I started yoga I was one of the heaviest women in the class and I didn’t give AF. I was there for me and had fun with the practice. I would laugh at myself when I fell out of poses or couldn’t get into a pose. What mattered most to me was the attempt. I completed a 200 hour YogaWorks teacher training in the fall of 2016. What are you favorite ways to move and why? Yoga, calisthenics, workouts on monkey bars, suspension training and inline skating. All of these modalities involve dealing with one’s own body weight. I think it’s super important to be able to toss your own weight around before using crazy nonsensical gym machines and weights at a gym. What has movement brought to your life? Peace, ease, energy, awareness, appreciation, gratitude and awesome friends. When you started, was weight loss your goal? Weight loss was the goal but I was also looking to become physically stronger. How is your relationship with your body now compared to before your journey started? I was always grateful for what my body was able to do despite being heavier than I wanted to be at times. Now I’m even more appreciative and I think that additional appreciation comes from my yoga practice. I appreciate how my body is its own universe in a sense, so mysterious, and it works so hard to keep me alive and well. There’s so many bodily functions and processes that are still unexplained but work so harmoniously to keep us balanced. What would you tell people about getting started? Start by moving your body in a way that you love or can fall in love it. Try different classes. Dance in the mirror or while you’re cooking or play in the park even. If you hate going to the gym then don’t go to the gym. If you hate running/jogging then don’t do it. Once you start moving try revisiting those things later to see if you still hate them. Live your life doing things you love to do. It’s all a matter of finding what you like and doing it consistently. Nutrition plays a big role as well so start making small changes and eventually it will lead to bigger changes and results. Sometimes it’s a matter of trial and error when it comes to fitness and food choices. What works for some may not necessarily work for you. And even with all of that with time your body changes and you may need to adjust your level of activity and food choices. Find balance in how you eat. Enjoy your food, never call it a cheat meal or cheat day. You’ve simply indulged. Take the guilt out of eating something you’d consider unhealthy. Your language and feelings towards foods that you eat can affect how your body processes it so be mindful of that. What does movement mean to you? What would you tell people about staying with it? If you are moving in a way that you’re body loves, you will stay with it, even if you take breaks every now and then. It’s also helpful to have a tribe to join you your journey. Take breaks and rest when you need to. My road to wellness is ongoing and infinite. The knowledge to be gained is never ending especially as my body changes with age. So I’m always open to learning more and sharing what I’ve learned and keeping an open mind with regards to health and fitness. The most important thing that I’ve learned is that everybody is different, what works for one person may not necessarily work for another person when it comes to nutrition and movement. Get outside, get some sun, play like a child and have fun! Thank you Aisha for inspiring so many.